This long, dreary and very cold winter has me looking for tiny signs of spring. A couple weeks back I pruned the Flowering Quince and brought some of the trimmings inside. Here it is blooming in my dining room only with much lighter blooms than what it's doing outside. The Inland Sea Oats (Chasmanthium latifolium) is starting to pop up causing me to dither about whether or not to cut the old stems off. Are there more hard freezes in the offing? Well even if there are, it's growing now so it probably won't hurt to cut them off. I'll do that this weekend. 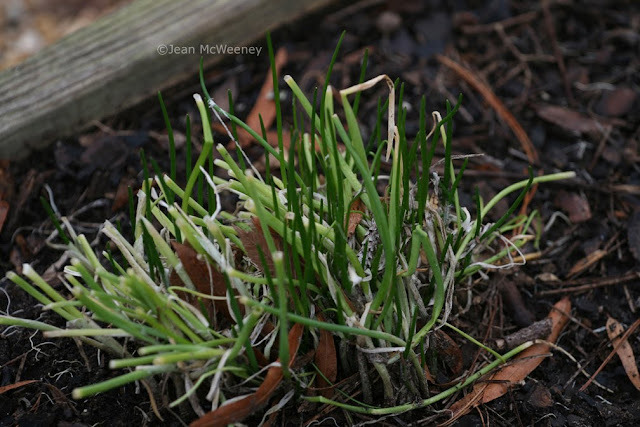 After the "Artic Blast" of early January the autumn transplanted chives looked horrible. Although I was tempted to leave them as is because of future freeze risks, I just couldn't stand the look of them wallowing in their sad bedraggled state. So I cut them back and now the dark green of new growth is poking through. Any light freezes to come will be okay (they've already gone through a few). 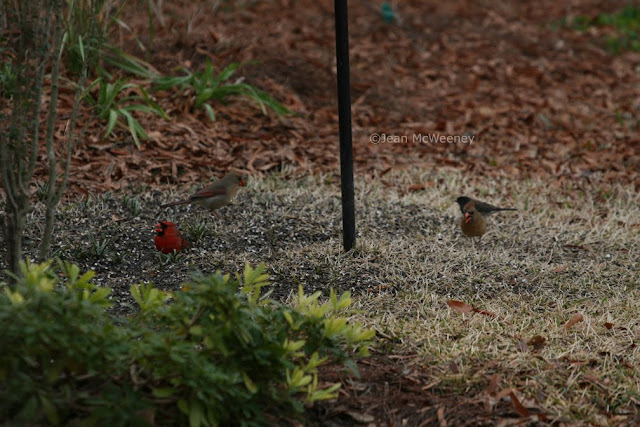 There has been tons of activity at the bird feeders. Sadly we had only a quick fly-through by the American Goldfinches. In "normal" years they arrive at our feeders in early January and stick around until about mid-March. This year I had a quick siting of them last week, about 10 of them, and then they were gone. I took this photo through my kitchen window of this White Breasted Nuthatch on the tree because he was just frozen there (not literally). All the birds had disappeared momentarily but this guy hung on completely motionless. I didn't spot any nearby hawks so I'm not sure what was going on. Which reminds me, don't forget about The Great Backyard Bird Count going on February 12-15. Click on the link on the right of my page for more information on how to participate. 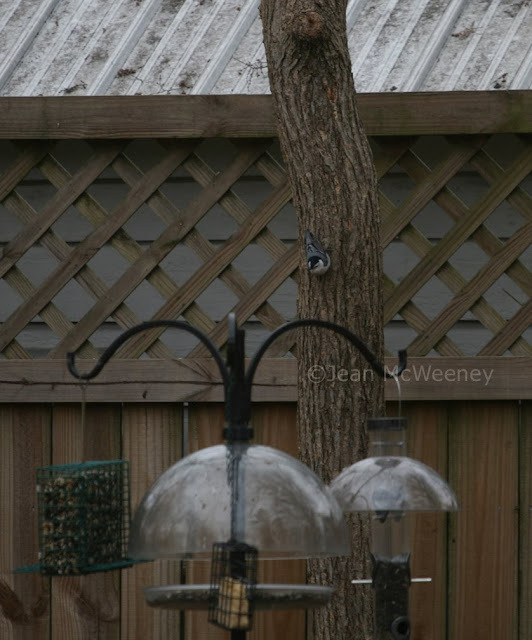 I hope to add this little nuthatch to my count this year for the first time. And for the first time, no goldfinches! In contrast to the poor folks in Texas, Oklahoma, and elsewhere who have been pruning ice-damaged trees from last week's ice storm, we finally had the tree trimmers out to do a little rejuvenation on some of our older trees. First order of business was trimming some of the lower branches from our Willow Oak (Quercus phellos). This will allow more light to a crape myrtle as well as some beds. 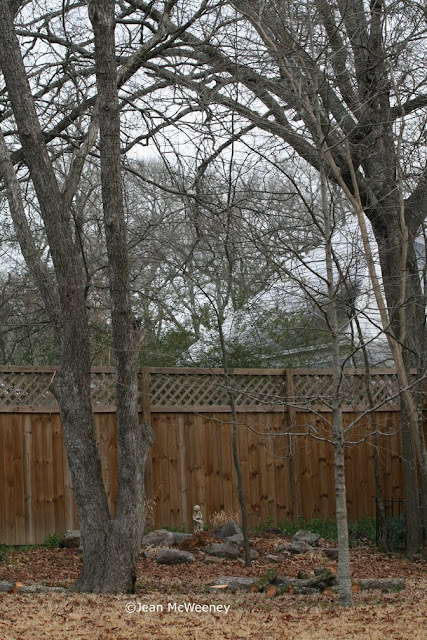 Below is the newly pruned oak and the crape myrtle to the left. We also wanted to lighten the load on our old and potentially dying pecan tree. We've lived in this house for five years now and have been babying the pecan tree for almost that long. It was never in good shape but it provides some great shade in that part of the yard. So a few years ago we had a red oak planted about 10 feet in front of it in hopes that it would take over shade duty when the time comes to remove the pecan. 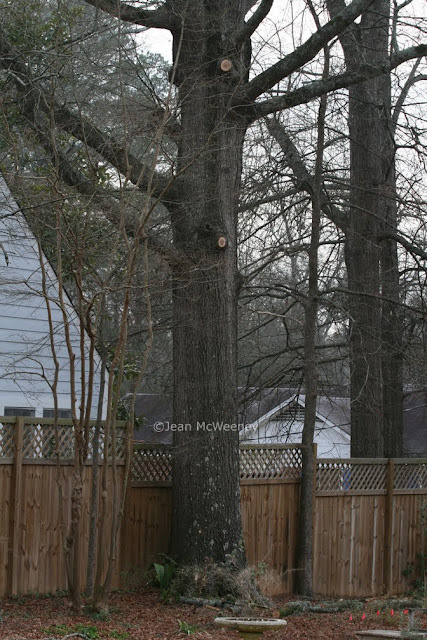 In the meantime we keep removing limbs in the pecan to lighten its load and prevent it from keeling over. Here's the lower part of the red oak. It's grown very tall in a few short years! I have such high hopes for it that I think this may be the pecan's last year. I better plan accordingly for the back "shade" garden! Oh! Thanks for the reminder! 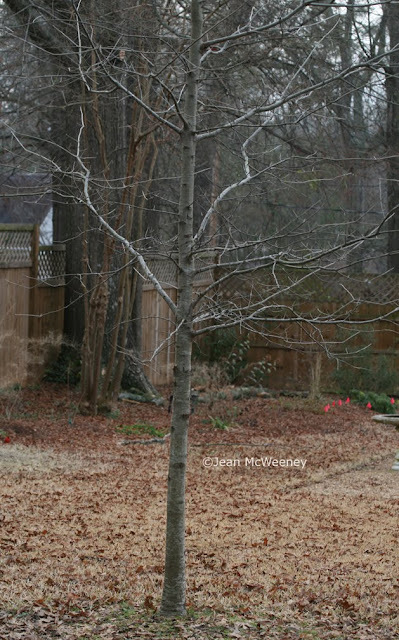 I planted flowering quince last year and I had forgotten about it until I read your post! Now if I can only remember where I planted it so I can keep an eye out for the blooms! I saw a quince blooming on the way to work this morning and it made me smile. Love the idea of forcing branches indoors! Cute picture of the birds on the ground! 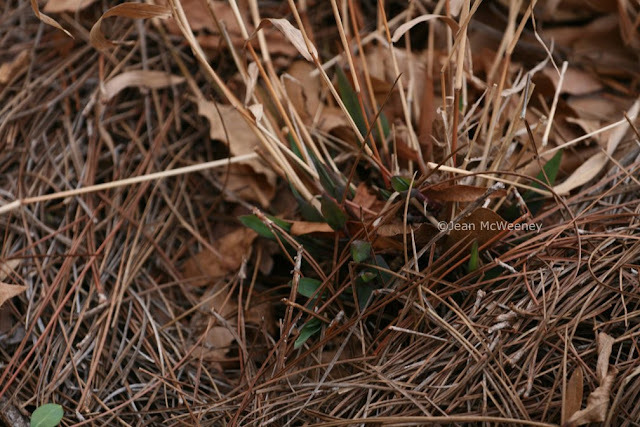 Hi Jean, Wish we could have flowering quince here. Lovely. Do you get fruit from yours? Lovely photos. I was glad to see what you thought about inland sea oats. This is my first year for them and I've been wondering when to prune. Been thinking the same about the garlic chives. Nice to glean gardening insights. Thanks for your comment at Hill Country Mysteries. Look forward to keeping up wth you. 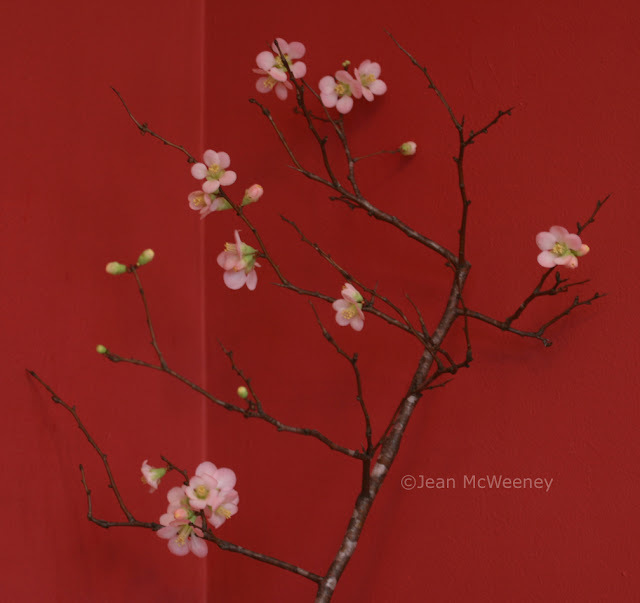 Thanks for showing these branches of the flowering quince, Jean. I was just reading a list of things to do in our area soon, and one of them was forcing flowering branches inside. I've never tried this before, and I certainly hadn't thought of using some from my quince. But these flowers are so lovely, I will definitely have to try this! 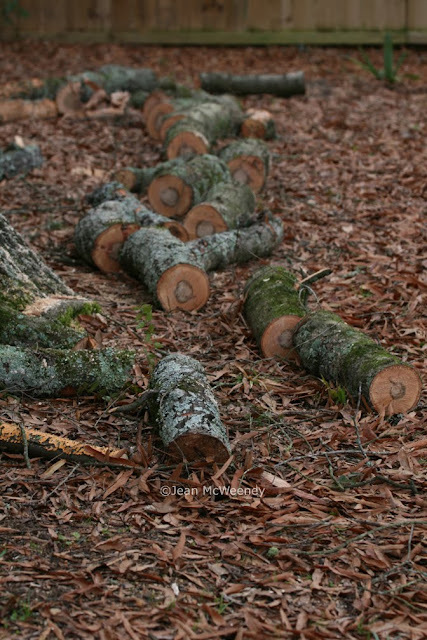 Looks like your tree-trimmer did a great job. I, too, feel sorry for those who have to trim up after an ice storm. The results on the trees are usually not so pretty. Pam and Ginger - thanks! Kathleen - no, my quince do not make fruit. I think you need another type for that (Japanese quince maybe?). You should be able to try it in central TX as I had one when I lived in Austin. They're kind of a plain bush when not in bloom though, so give some thought to placement first. Rose - you should definitely give forcing a try. Just about any early flowering tree or bush can be tried. I wonder if deer like flowering quince. My mother always had one, in north Texas. They are beautiful spring bloomers. I need to get out and clean up some freeze damage. We could still have some hard freezes, though. I love the pale color of the flowering quince. My mother's quince is in full bloom and I do believe I should add a few of them to my garden. Heaven knows there's room for it now ... there may be more after next week! I hope you and I both come through without more damage! I too enjoy forcing flowering shrubs, usually forsythia. Of all the shrubs I have, quince is not one of them and one I've been wanting for years now. Some have the most vibrant blooms! Also, glad to see you did end up submitting your photos to Crimes Against Horticulture. I did take the photo I mentioned and posted it there yesterday. Love the quince, such pretty flowers! I know those signs of spring will move slowly north. Encouraging! The quince is a painting against that red wall. Awww, Sea Oats! They are such incredible plants... I love planting them in mass. Patchwork - the bush has thorns so I doubt if the deer would like it. Anyone who's considering adding a flowering quince to their landscape - they do not make for a very interesting bush when not in flower, so plan accordingly. But they're a welcome sight in the winter! Hi Jean! I love your first photograph ... it is so striking with the red background... very Japanese like. It is great you are able to do your own pruning ... looks like you had to have a pretty high ladder! Did you really do that yourselves... hard to get a chain saw up there... but you must have used a hand saw until the limbs were on the ground. You must have ... right? I am so jealous ... I want to be doing this or I should say ... getting it done! Carol - pruning the quince is actually a whole lot easier than you think. My quince (and other ones that I've seen) are only about 4 feet tall. They're kind of a gnarly looking bush. I trimmed out a lot of criss-crossed branches with a pruner and a lopper. Some of the branches were fairly long though, so I put them in a tall vase and placed it on the floor. Love the first shot also! My flowering quince hasn't bloomed once since I got it over a year ago. Bah! So jealous of yours! I'm with Pam on that pink and red combo. Interesting that the flowers are so much lighter when forced. Our quince is in an inaccessible spot (just had another 5 inches of snow) or I would be tempted to do a little pruning to bring indoors as yours looks so lovely.